The Caribbean is always a good choice if you are going on vacation, no matter the length. This time we have found you a flight from New York to Santiago de los Caballeros in the Dominican Republic for $325 r/t with taxes and fees. 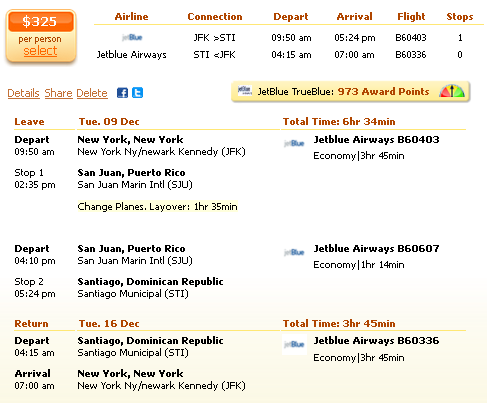 Fly in mid December, before Christmas, with JetBlue Airways and save nearly $100 compared to other companies.This Dominican Republic flight deal can be booked on Faregeek but we have found it on Travelgrove. You should also check the other providers to see if any of them has got an even cheaper ticket! Fly in at the end of the year from John F. Kennedy International Airport (JFK) on December 9 and fly back one week later from Cibao International Airport (STI). While the departing flight has got a 1 hour 35 minutes stop in San Juan, the return flight is non-stop. The airline’s frequent flyer program, JetBlue TruBlue will give you 973 award points for booking this fare. JetBlue’s flight deal costs $325 r/t while the second cheapest flight is an American Airlines airfare for $413 r/t. If you book the offer we have found you can save at least $88. This entry was posted on Thursday, November 20th, 2014 at 2:24 pm and is filed under Airfare Deals. You can follow any responses to this entry through the RSS 2.0 feed. You can leave a response, or trackback from your own site.